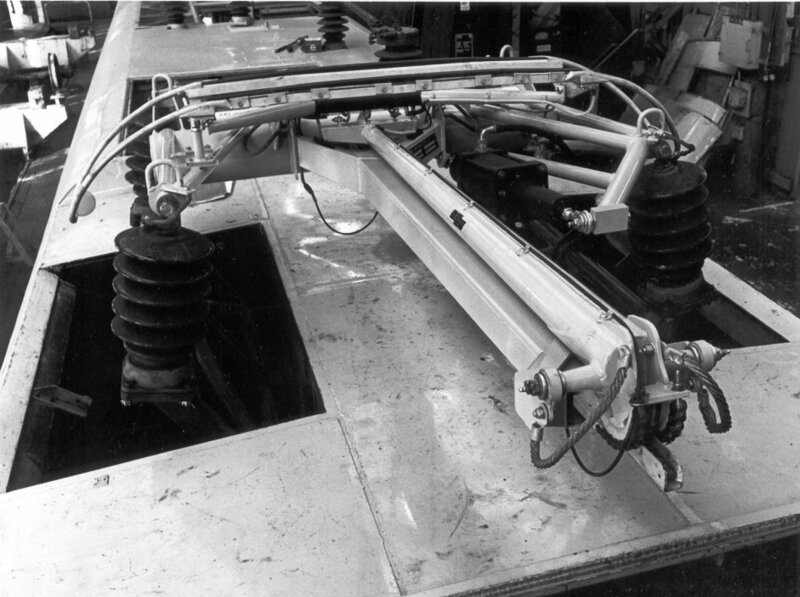 Following the successful high speed current collection programme (HSCCP) undertaken by BR's Research & Development Division at the Old Dalby test track, the BR/Brecknell Willis Highspeed pantograph was born. 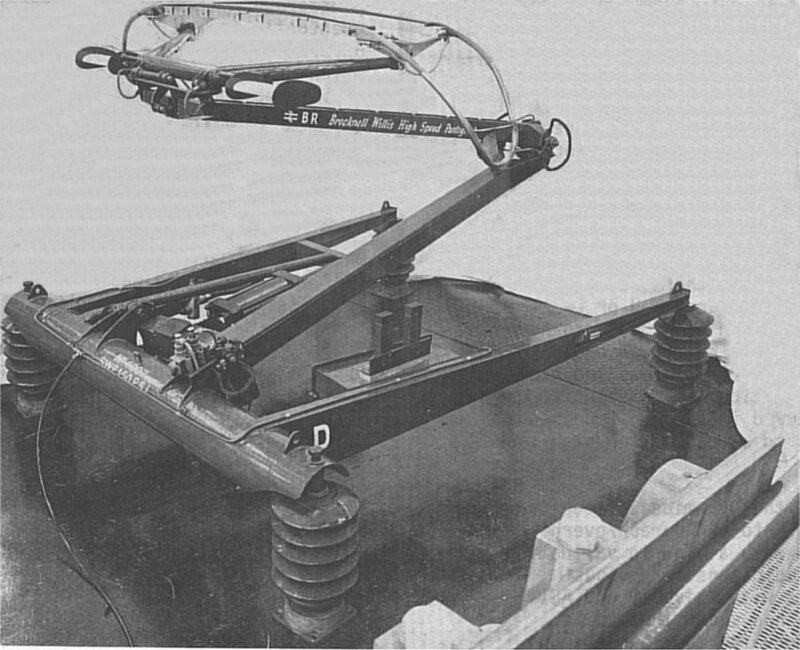 Following the extensive R&DD development programme of the pantograph, which was based on Brecknell, Willis' simple Highreach Rapid Transit pantograph, the final product featured primary air suspension, an air reservoir built into the base frame, secondary torsion bar suspension, lightweight carbon carriers, aerofoils and an aerodynamically balanced head and was capable of excellent current collection at speeds up to 160mile/h. Here are a selection of photos of the various tests undertaken during the pantograph's development. This is the initial production version of the BR/BW pantograph on the standard locomotive base frame - a shot in the lab for publicity purposes. Note the aerofoils, the air reservoir built in to the front cross member, the one piece aluminium lightweight carbon carriers, the tabs on the end of the horns to balance the head and the robust production air cylinder. Also note the name painted on the top arm - 'BR Brecknell Willis Highspeed Pantograph' to reflect the joint effort which went into its development. 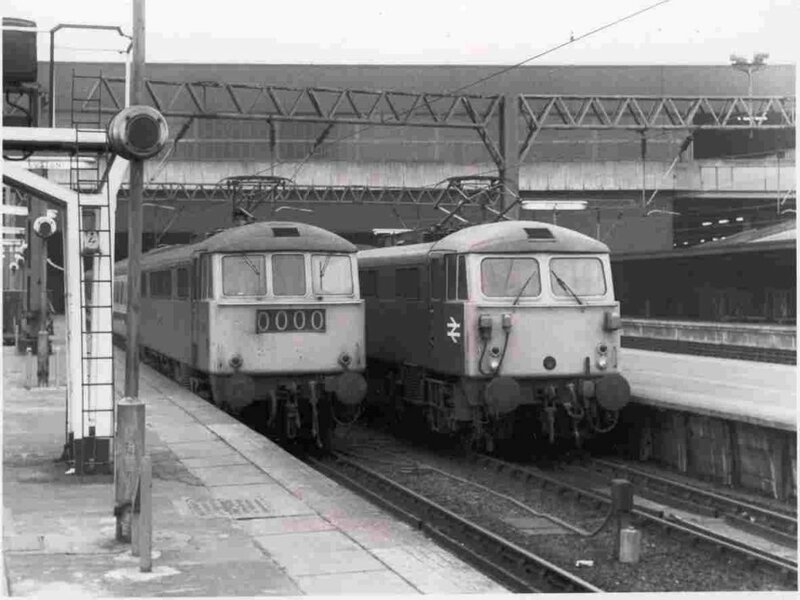 A class 86 with an example of a Stone Faiveley AMBR pantograph and a class 87 with an AEI Cross Arm pantograph pictured at Euston on 13th February 1980. 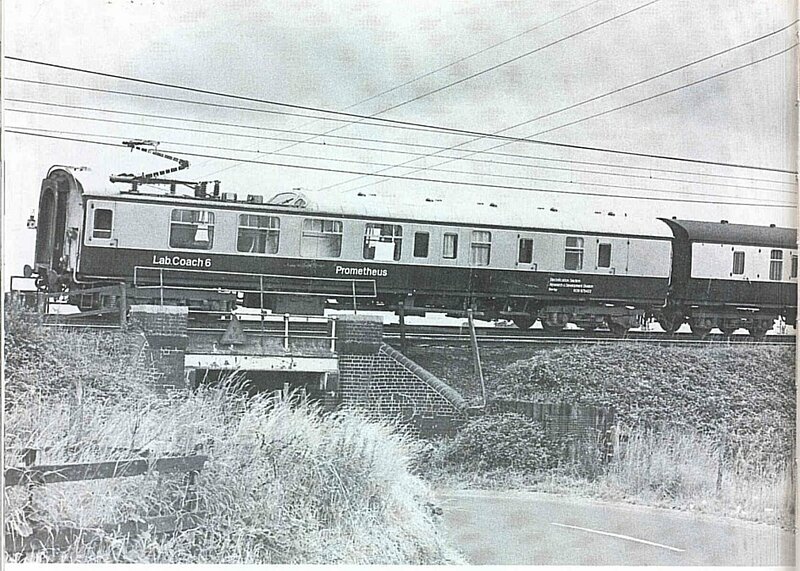 An early version of the pantograph pictured on Lab 1 at Old Dalby - note absence of aerofoils and the separate horns. 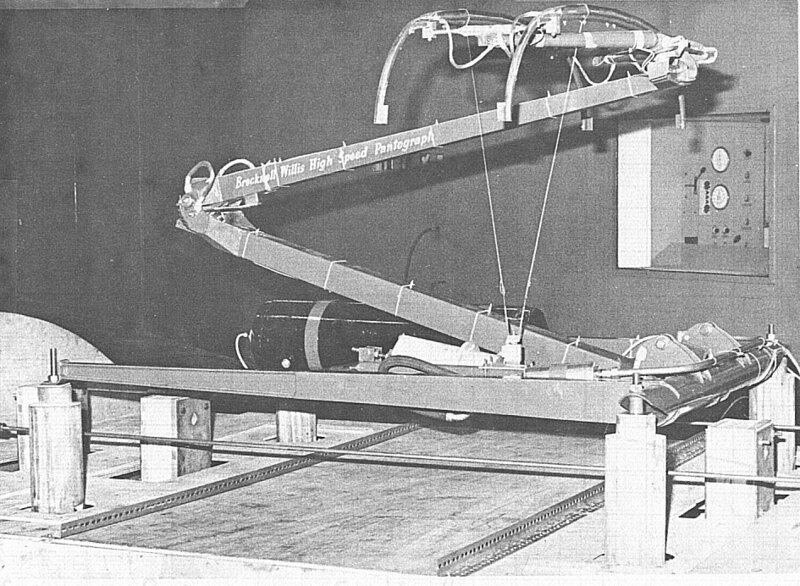 The pantograph underwent aerodynamic testing in the wind tunnel at the Motor Industry Research Association (MIRA) near Nuneaton. 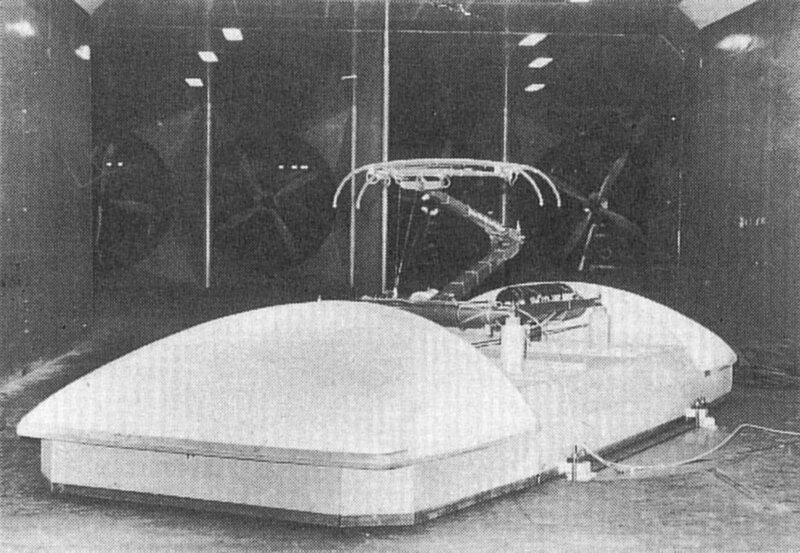 Here it is shown on a mock-up roof on the turntable in the wind tunnel. 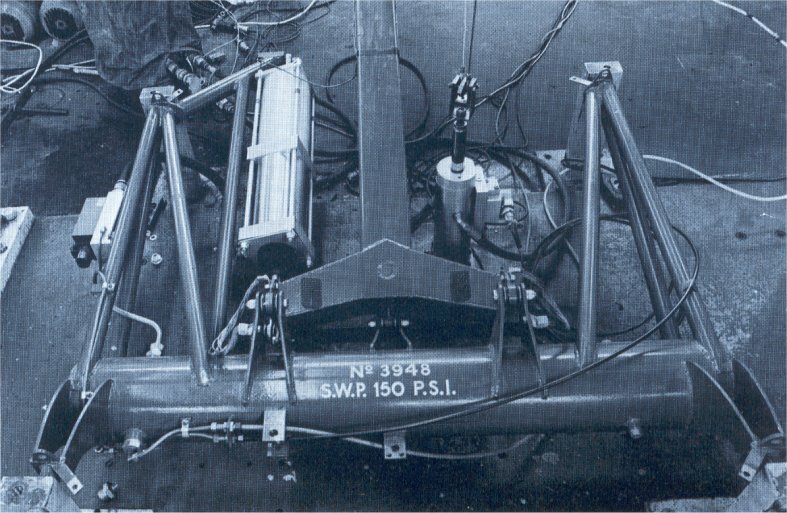 Note the restraining wires and instrumentation. 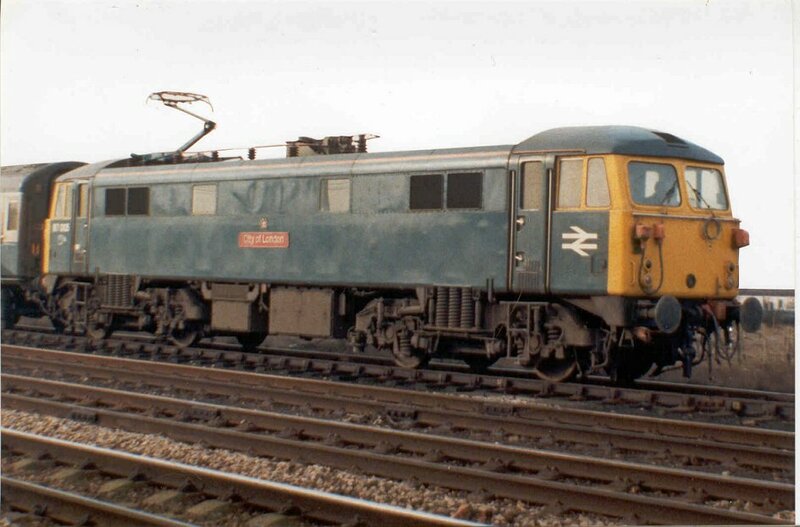 After extensive trials at Old Dalby the pantograph was mounted on the R&DD Electrification Section's Lab Coach 6 'Prometheus' which was able to run under 25kV and in December 1978 undertook a week's running between Euston and Blackpool. 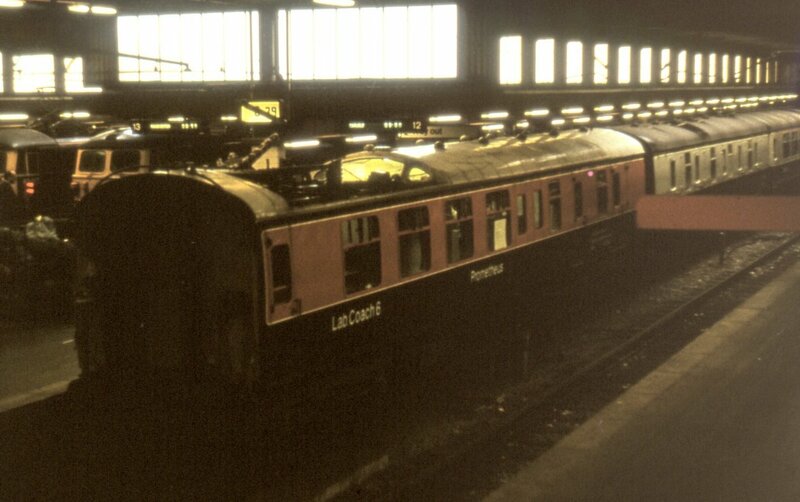 The Lab Coach was attached to the rear of a service train and the pantograph was lowered at Preston as the line to Blackpool was not electrified. 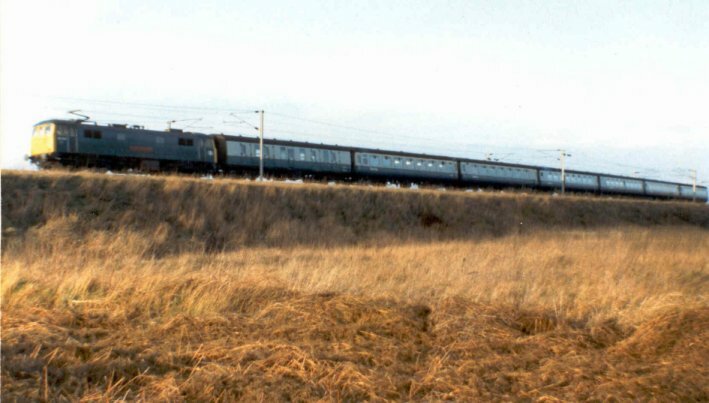 During these on track trials, several unexpected and related problems were observed in that at around 100 mile/h when running with the pantograph knuckle trailing the pantograph's uplift force was adversely affected by the aerodynamic forces and it failed to maintain contact with the overhead wire. This was completely unexpected as during all the testing at Old Dalby the pantograph had run with its knuckle leading. Also the measured uplift forces in its normal direction were seen to differ greatly between the two carbon carriers. Something must be done! Back at the RTC following these set backs, the pantograph underwent some fundamental design changes, especially in the area of the head which was aerodynamically balanced including modifications to the cross-section of the carbon carriers and the addition of 'tabs' to the ends of the horns. Additionally the pantograph benefited from the then unusual step (in the UK) of having specially designed adjustable aerofoils attached either side of the apex frame. 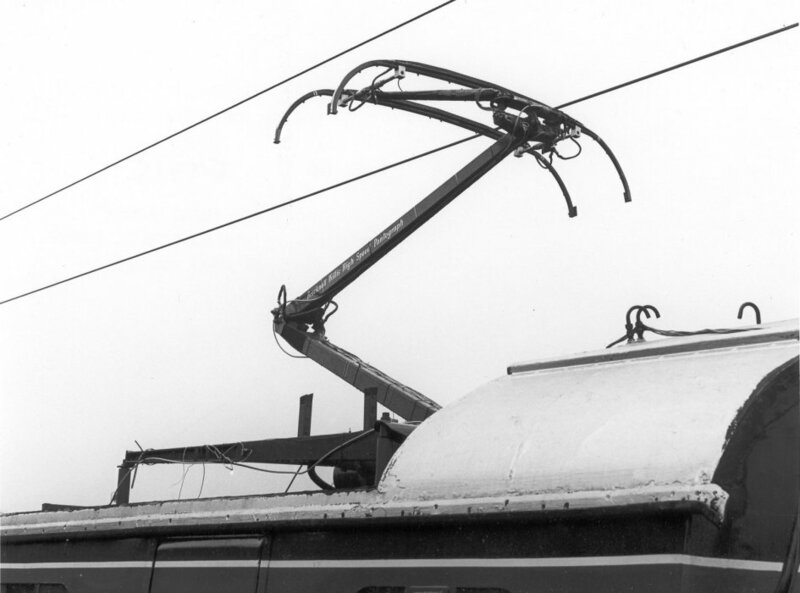 On July 30th 1979 the modified prototype pantograph had its second test series on the main line. 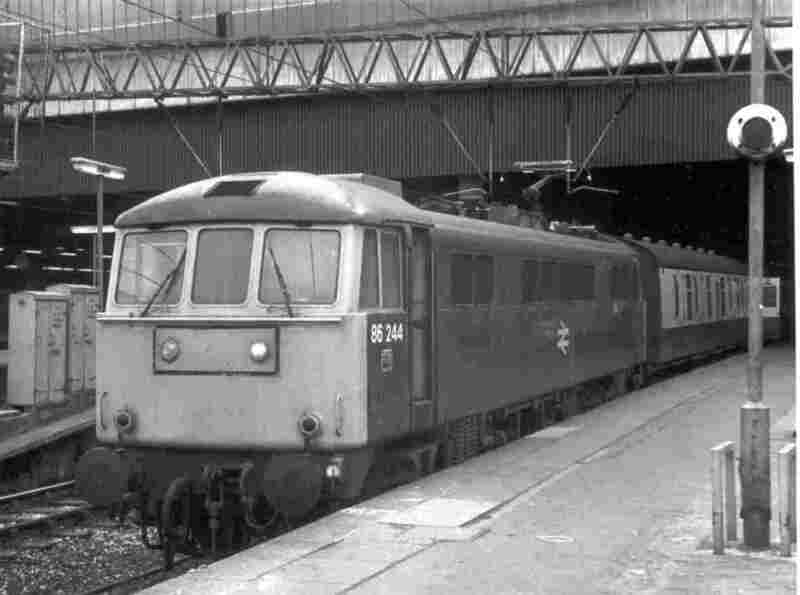 Mounted on Laboratory Car 6 'Prometheus' RDB975422 at the rear of a service train, running took place between London Euston and Carlisle for a week. On arrival at Carlisle the Lab Coach was removed from the rear of the train and shunted into Upperby Yard where the rake of coaches was later placed on top ensuring that it was once more at the rear for the return journey to Euston. The pantograph's performance at the rear of the train as the second pantograph was remarkable. It was as good as the Faiveley when leading and our pan was running on an already moving contact wire. This rather dark picture shows 'Prometheus' at the buffer stops at Euston on the rear of the 09.00 departure for Carlisle. A close up of the original aerofoils fitted after the first series of main line running Photo taken on the roof of Lab 6. 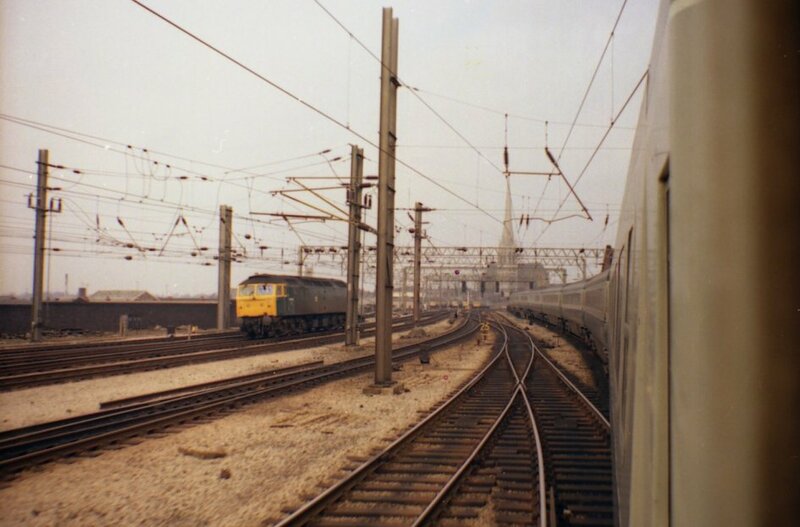 The 'high wire height' tests had HST super power as can be seen from the picture and ran at up to 125 mile/h between Selby Station and Shaftholme Junction on the old ECML alignment, which at the time was not electrified. Both the BR/BW and Faiveley pantographs were tested and the picture shows the latter under test in September 1979 mounted on Lab Coach 6 'Prometheus' . 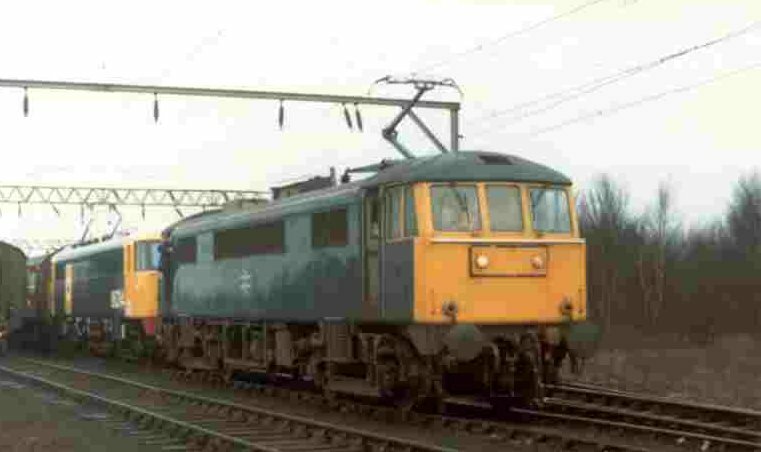 By February 1980 the pantograph was fitted to class 86 locomotive No:86 244 for extended trials. 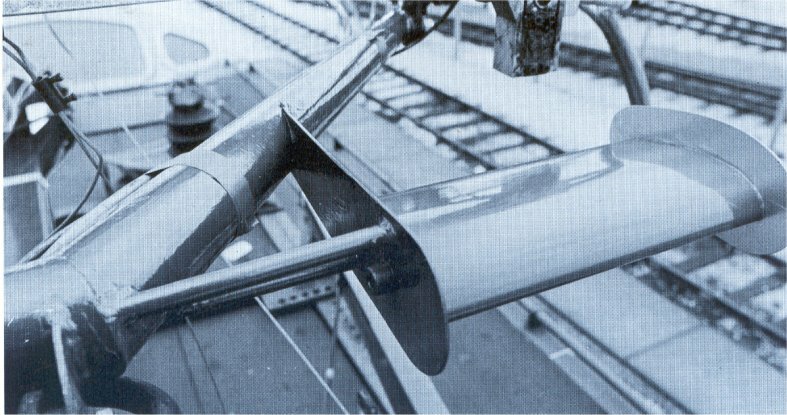 For this trial the angle of the aerofoils was adjusted to give the best performance based on the roof profile of the locomotive related to the knuckle trailing situation. A bit of a black art this aerodynamics - but it seemed to work. 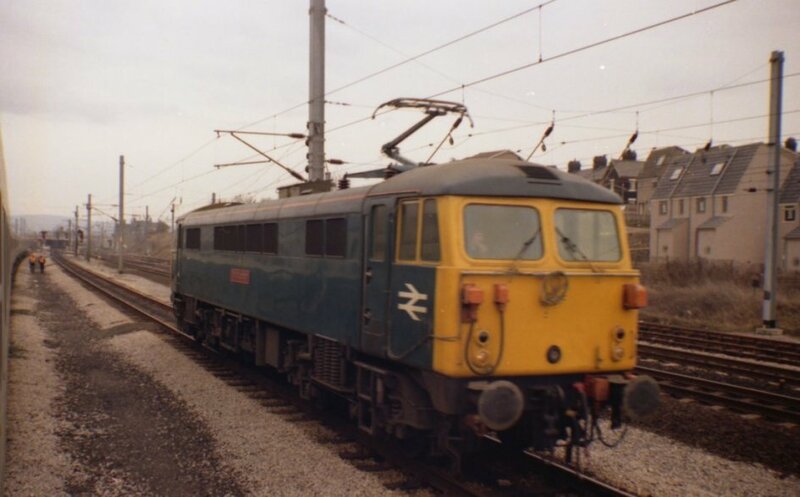 86244 pictured in service much later, at Hademoor Crossing on the WCML. 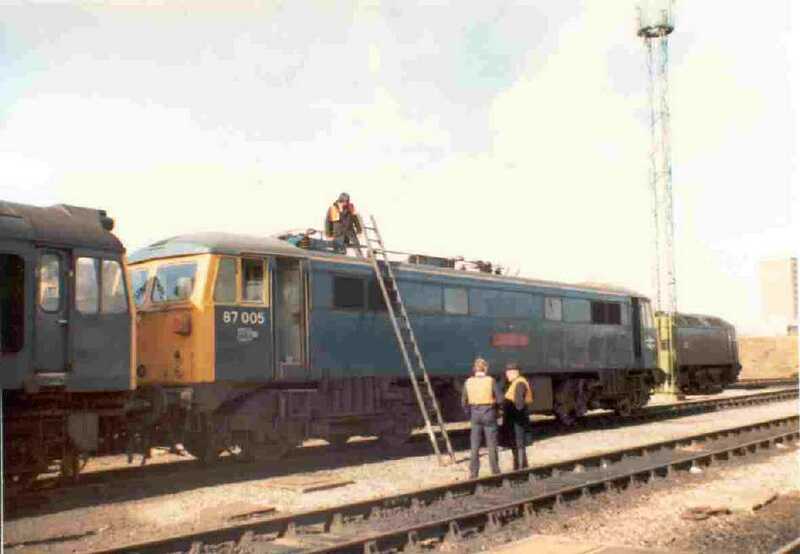 The pantograph covered over half a million miles on 86 244, but it was well looked after by R&DD staff. 87005 runs round the test train at Carnforth following the high speed run from Crewe. 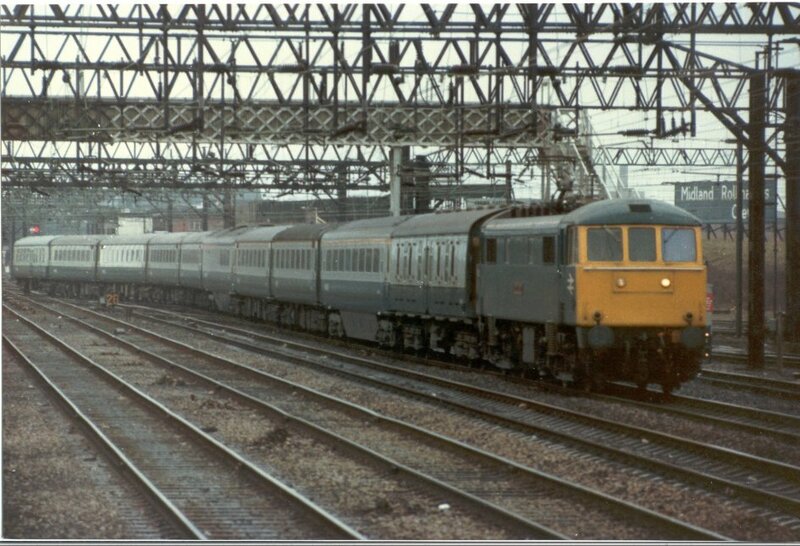 During June 1982 an unusual HST set could be seen on the northern end of the WCML. 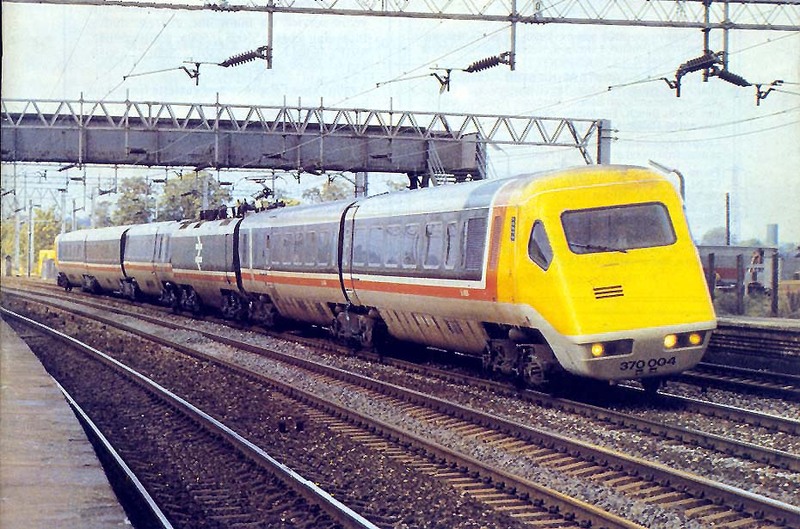 At the time there were proposals for an electric version of the HST which would have a power car at each end of the train with pantograph raised. 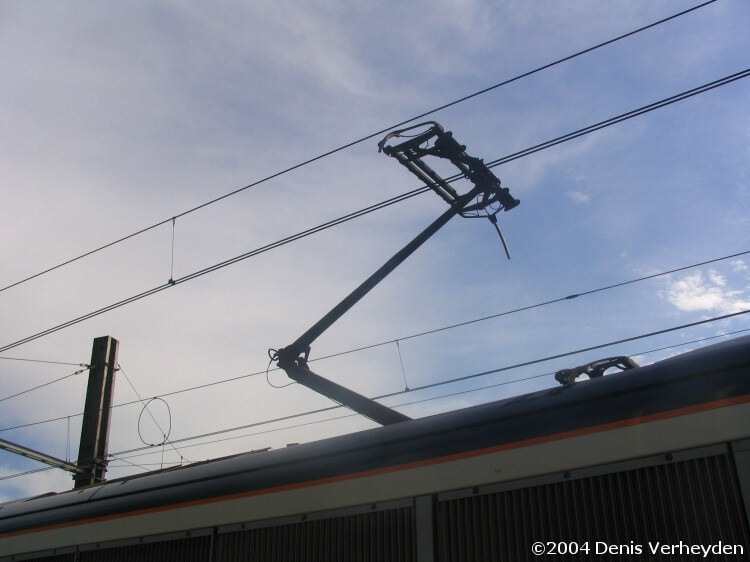 There was a reluctance by the IEE at the time to allow 25kV bus bars to run the length of electric passenger trains (particularly between vehicles) hence it would be necessary to have two pantographs, both collecting current on the new train - fortunately no such restrictions apply today so a Pendolino usually runs with only one pan raised and the new IEP will be similarly operated. And that's why APT-P had its power cars marshalled next to each other. 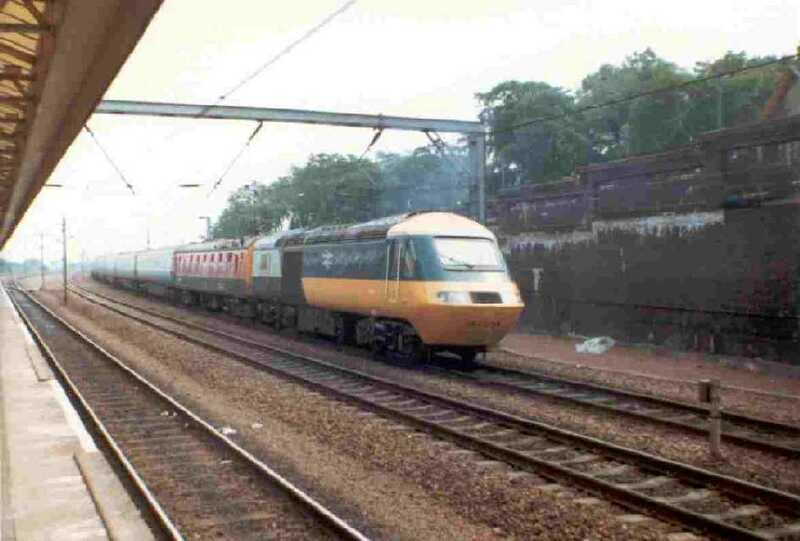 Based at Craigentinny Depot, Edinburgh the train was re-marshalled during the tests to form up to a 10 car HST set. With special arrangements in place and permission from the Civil Engineers the train was tested well above line speed at up to 125 mile/h down Beattock bank through Lockerbie towards Carlisle. 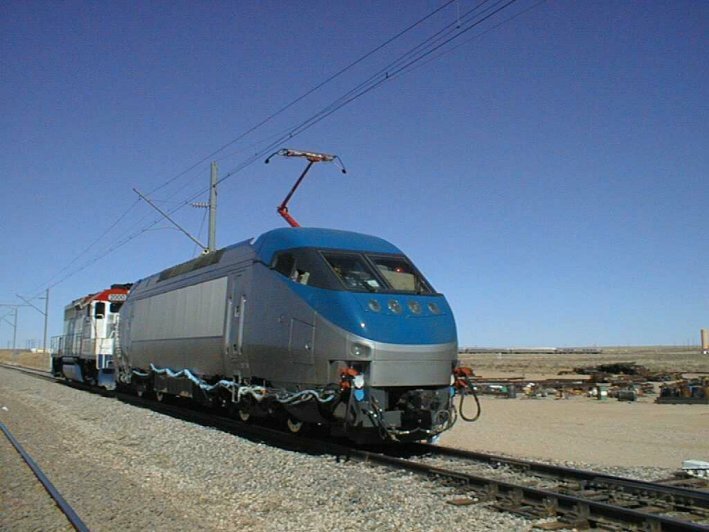 The formation of the train was varied during the tests to judge the affect of differing pantograph spacing on performance. Needless to say the pantographs performed very well. Further expansion saw the pantograph fitted to the Advanced Passenger Train (APT-P) in early 1980. On 'P train' the pantograph required to be aerodynamically 'tuned' to the APT-P power car roof profile by adjustment of the aerofoil angles. 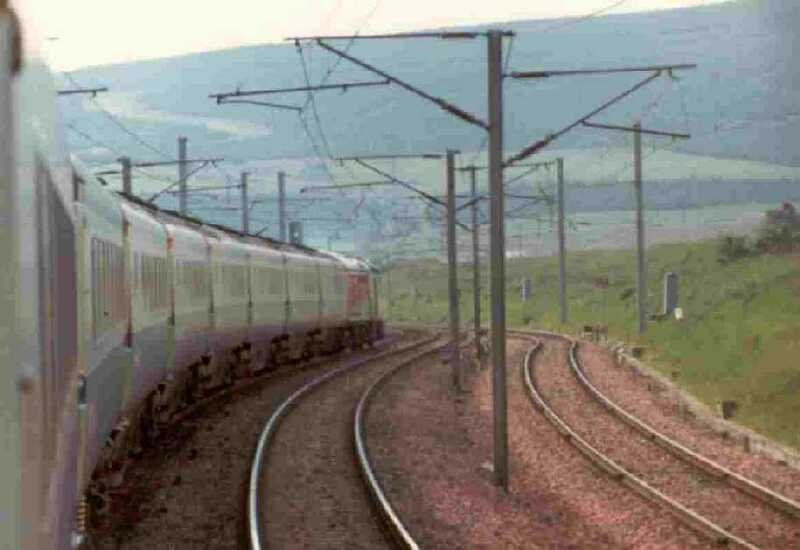 Following initial aerodynamic testing the pantograph operated successfully at speeds of over 150 mile/h between Beattock and Lockerbie. Happy days thrashing up and down the WCML! It was only fears by the ScR Chief Civil Engineer about a particular bridge that prevented us from going for broke. 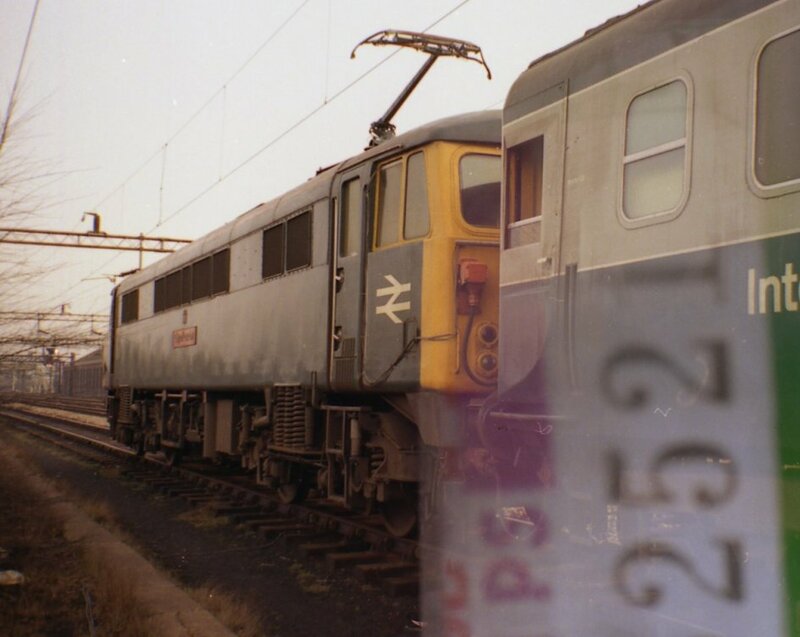 Author's collection ...... and is pictured later in the year in Willesden Sidings, London after an unfortunate train failure en route from Euston - we didn't get very far! A close up of the base of the APT version of the pantograph in the static test rig at RTC. Note the hydraulic actuator on the right and the restraining wires and the air reservoir now incorporated into the front frame member. By vibrating the pantograph at various frequencies and amplitudes the optimum values of pneumatic damping and spring rates were evaluated. 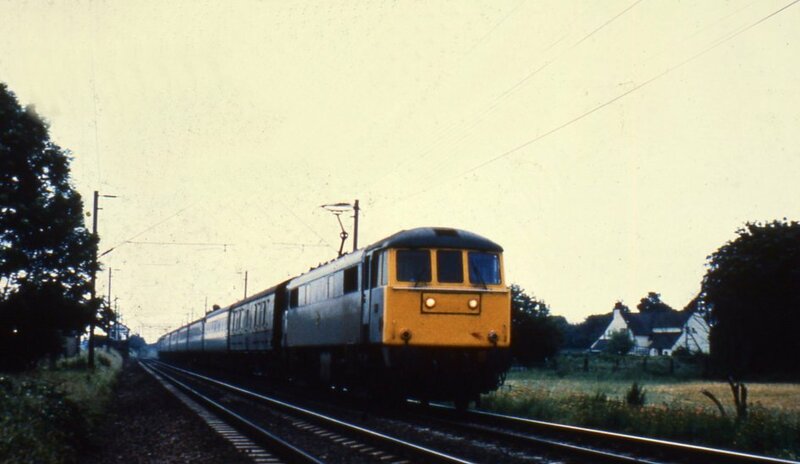 In 1982 the set is pictured passing Rugeley on the Trent Valley route heading south. 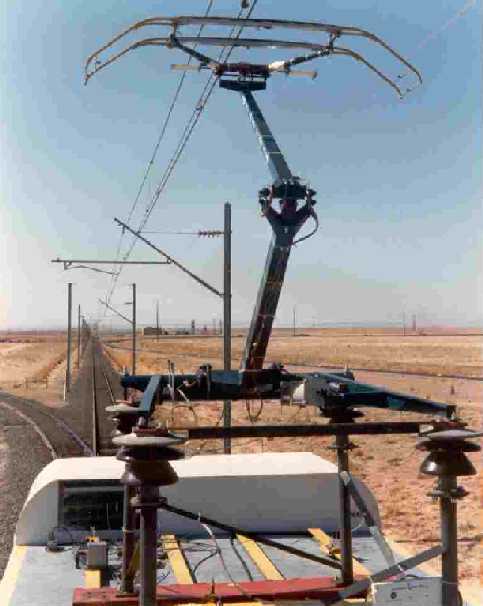 Further development and marketing saw the pantograph being trialled by SJ in Sweden and SAR in South Africa. 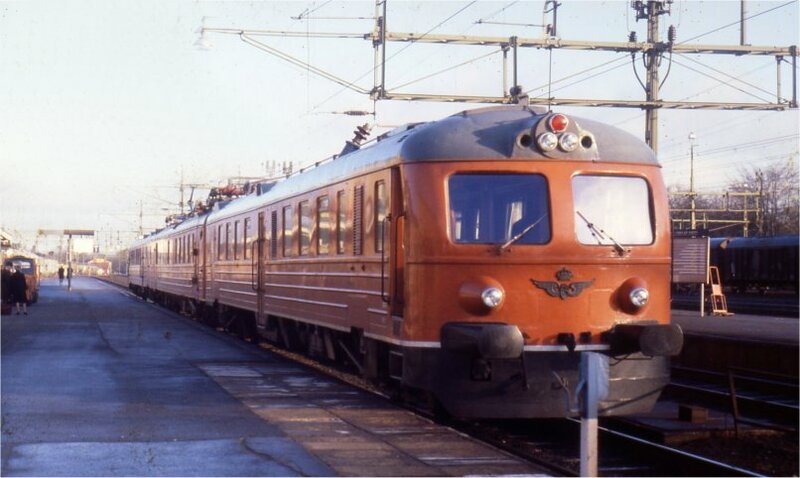 In November 1979, the X15 test EMU is pictured at Skövde after a test run - the Highspeed pantograph can be discerned towards the centre of the unit. 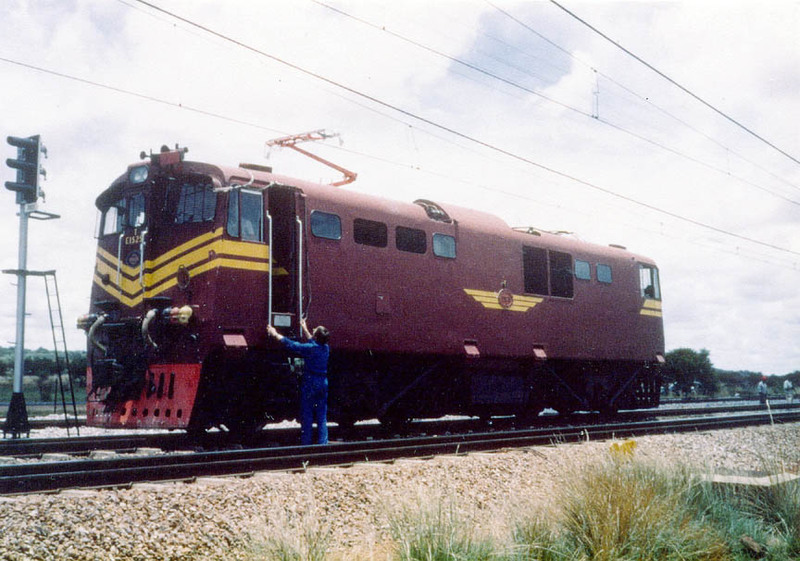 An SAR test engineer climbs aboard the GEC 6E locomotive E1525 which was fitted with a BR/Brecknell Willis pantograph. 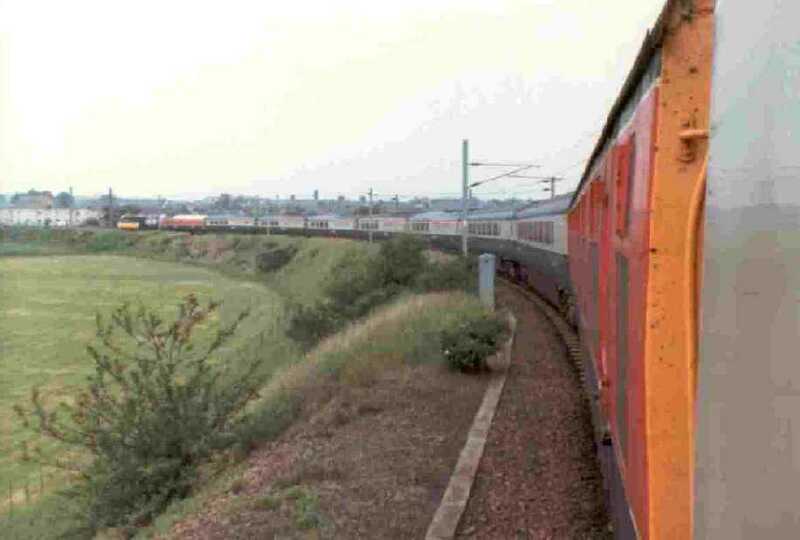 This picture was taken in November 1980 on the line between Pretoria and Kimberley. 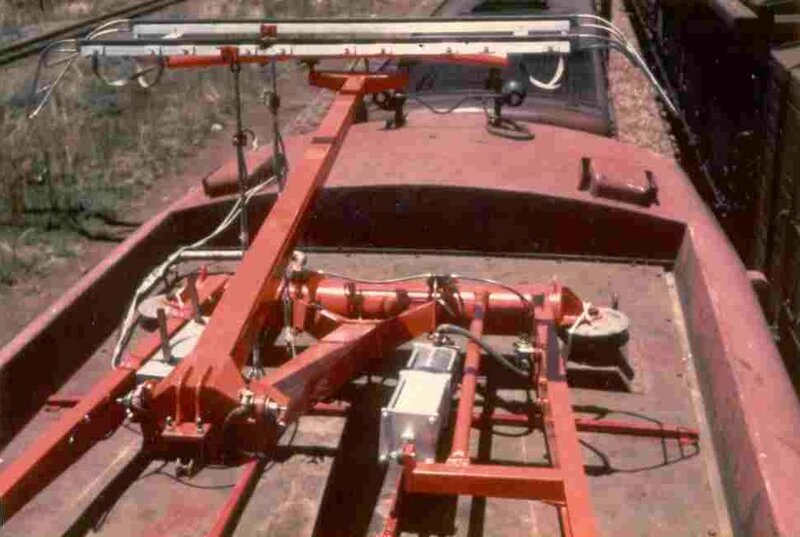 In the late 1970s a version of the highspeed pantograph was also developed by Brecknell Willis for the North East Corridor Project in the USA. This had a much longer reach than the European version and was consequently known as the 'Hugereach' pantograph. About this time, the Pennsylvania Railroad did run Metroliner test trains as fast as 164 mile/h (264 km/h) and briefly ran the daily Metroliner service at speeds reaching 120 mile/h (190 km/h) fitted with a hugereach pantograph in preference to the original two-stage Faiveley. 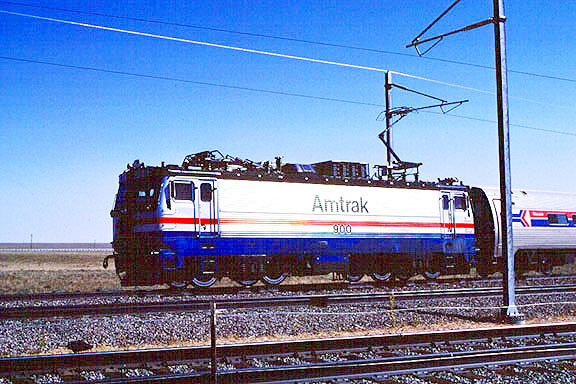 The AMTRAK ASEA AEM7 locomotives recently bought from Sweden at the time were also fitted with the pantograph. 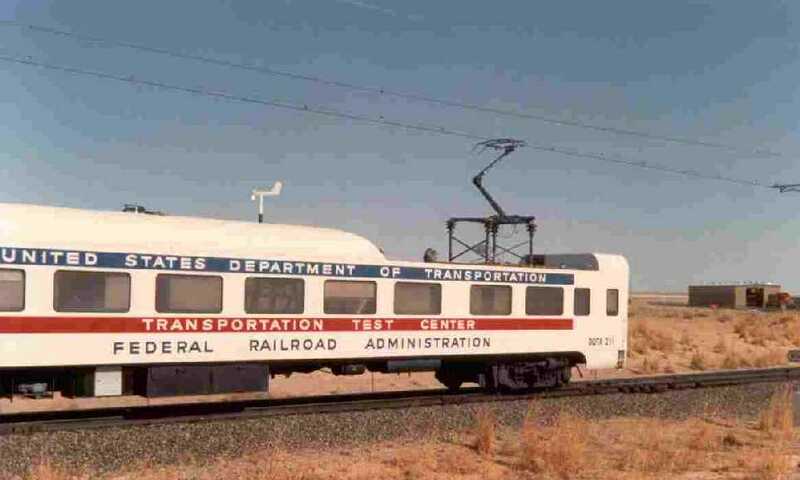 The BR version of the pantograph sits on a special framework on the FRA's Pantograph Test Car pictured on the test track at Pueblo, Colorado in May 1980. 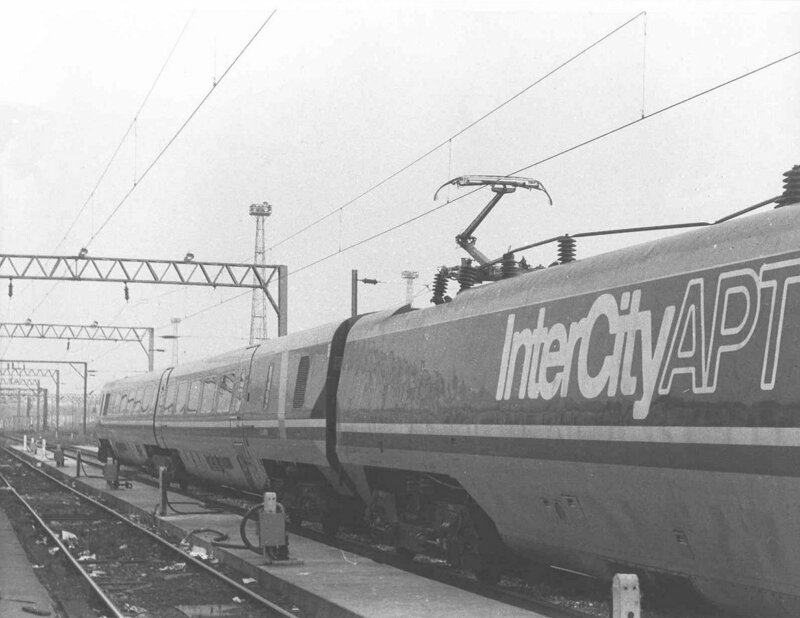 Following successful trials, in June 1981 a prototype larger version known as the 'Hugereach' pantograph was fitted to a 120 mile/h Metroliner, which were then about to start running between Boston and New York on the NEC. 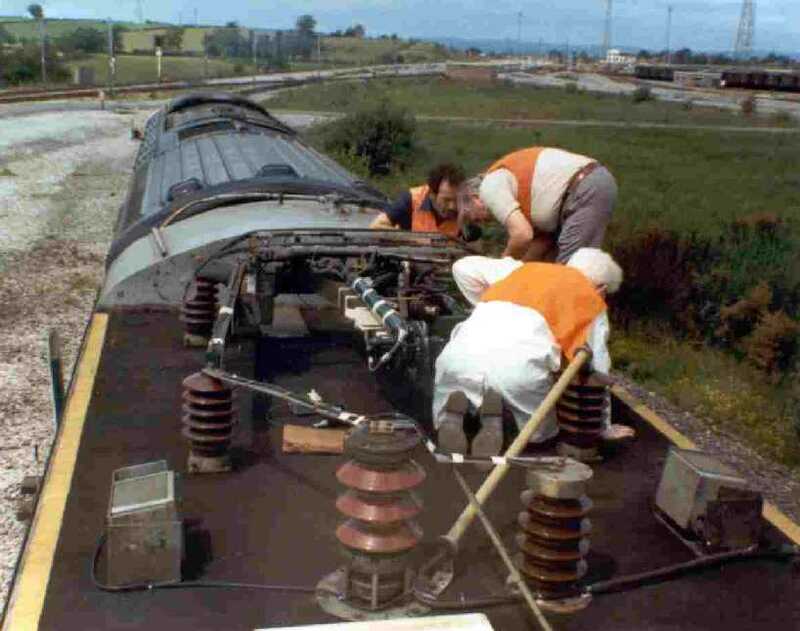 An order for 12 pantographs was completed by late 1982, which replaced the original Faiveley 2-stage pans. Here's a close-up of the arrangement. The British pantograph needed to be mounted on a framework to raise it to enable the pantograph to reach the OHLE, which is approx. 1 metre higher in the USA than in UK. Note the different head design for the US. 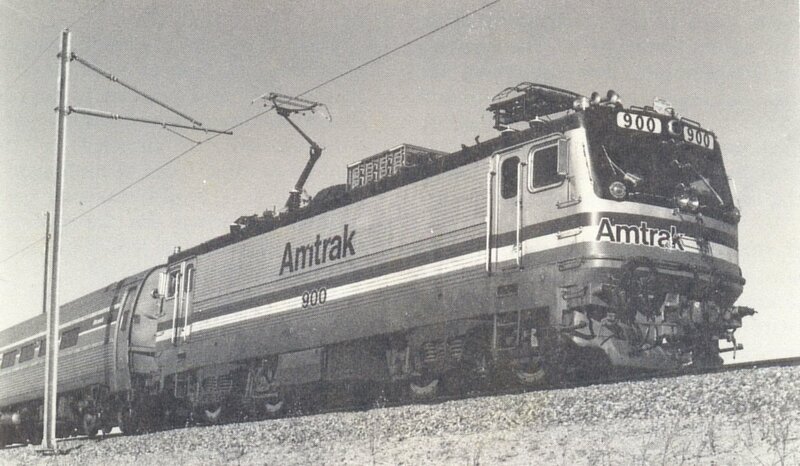 Another shot of 900 - look here for more pictures and find out what happened to this loco. 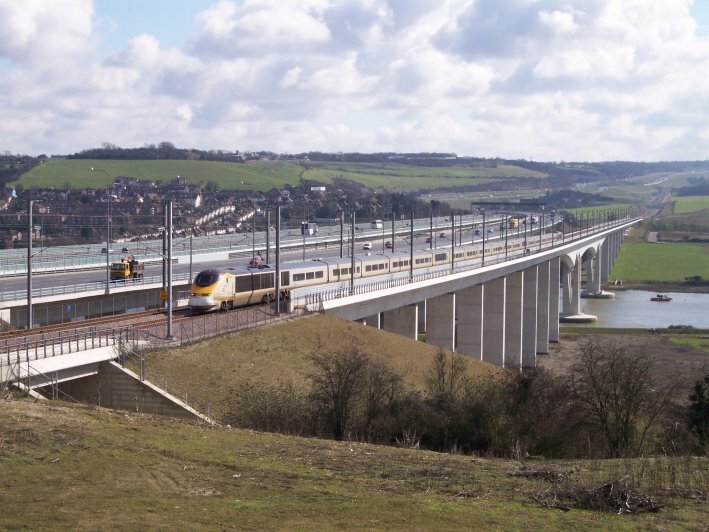 Today the pantograph and its variants are fitted to the majority of electric locos in the UK including the Channel Tunnel Shuttle locos, (among the most powerful locomotives in Europe) and to a large number of EMU fleets. 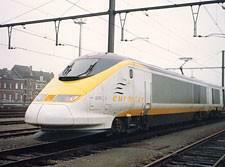 The Pendolinos are fitted with their own version as are the Eurostars (for use in Belgium). 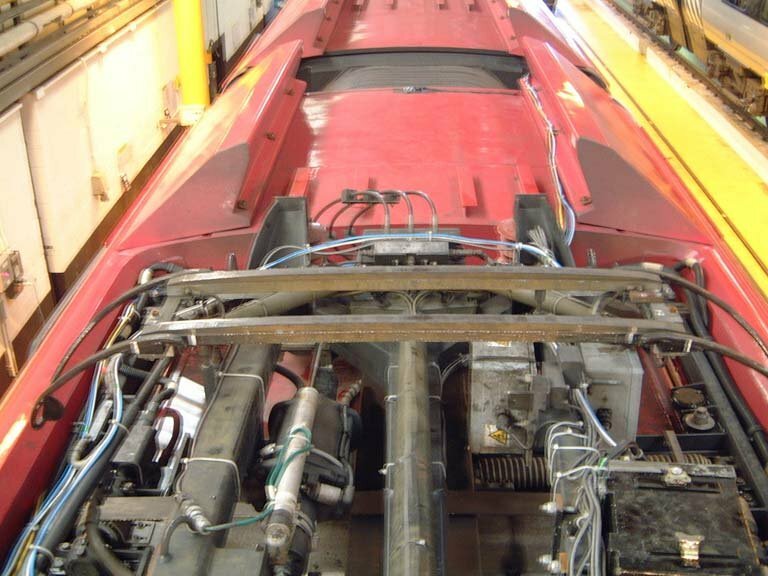 Developments in pantograph head design, which had their roots in the High Speed Current Collection Project and were tested at BR's Old Dalby test track, have been adopted by numerous train companies and can be seen on nearly all the Faiveley pantographs in the UK. The original 'Highreach' Brecknell Willis pantographs are also employed on the Tyne & Wear Metro and increasingly on the UK rail network and world-wide. The latest US high speed train, the Acela carries a BR/Brecknell, Willis Highspeed pantograph. 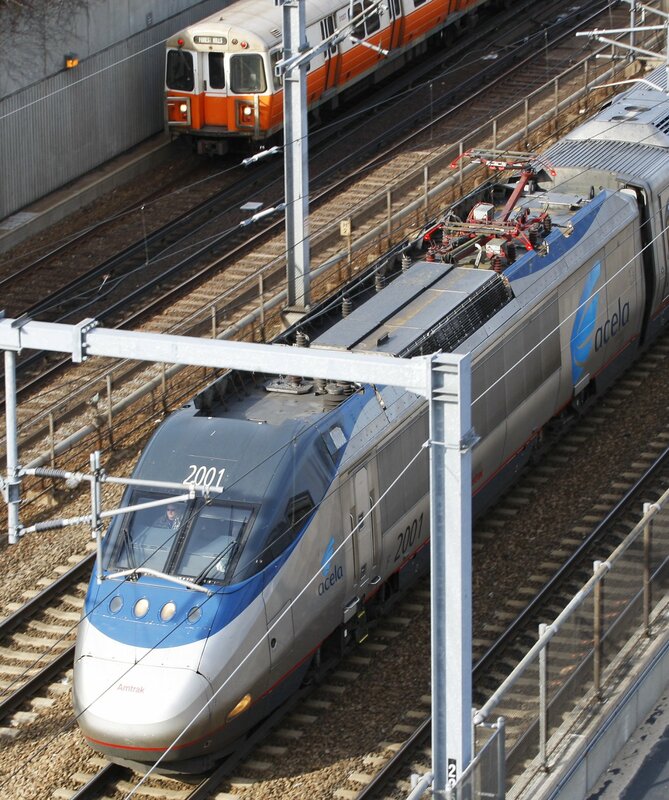 Here's a good view of the two BR/BW pantographs which are fitted to the Acela power cars - courtesy of Wikipedia. 'Acela Express power car 2001 complete with flannel clad engineer and flashing ditch lights hums past a Forest Hills Bound MBTA Orange Line Train'. A book was written about Brecknell Willis by David Hartland on the occasion of their 150th anniversary in 2004. Published by Middleton Press (ISBN 1 904474 292) it is presently advertised on the Amazon site for £14.95 but is 'out of stock'. 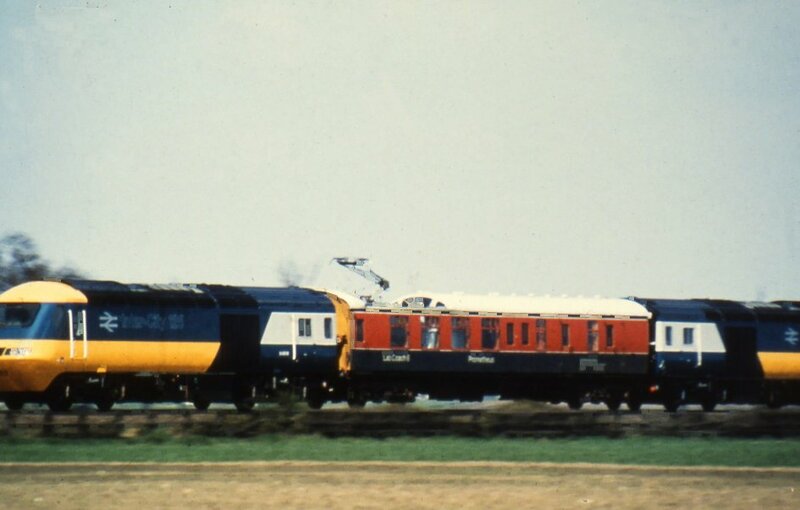 It is an interesting account of the firm's history but has some inaccuracies regarding the Highspeed pantograph's development and some incorrectly credited photographs - doh!